The Consumer Product Safety Commission recall notice warns consumers not to open the device. Take it off the ceiling or wall, then inspect the alarm through the opening on the side of the device. If you see a yellow cap, you should immediately contact Kidde toll-free at 833-551-7739 for a free replacement. We encourage you to read the recall notice for hours of operation and other information. 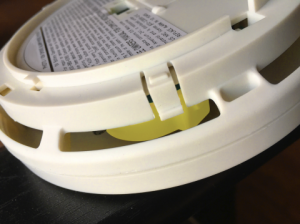 Kidde issued the product recall after the yellow cap was found on a smoke alarm which was about to be installed in a consumer’s home. No injuries or incidents reported. Kidde recalled 452,000 smoke alarms sold in the United States and about 40,000 in Canada. Smoke alarms are fundamental to safety. Massachusetts has strict laws requiring installation in residential and commercial property. Yet 3 out of 5 home fire deaths in the U.S. are caused by smoke alarm failures, according to the National Fire Protection Association. Nearly 40 percent of these homes had no smoke alarms and about 20 percent had non-working smoke alarms. Do everything you can to protect your family. Commit to replace the batteries when you set the clocks back or ahead for Daylight Saving Time. Regularly test your smoke alarm batteries every month. Please share this recall with family members and friends. Offer to help anyone who needs it. In addition to the elderly, check in with college students or adult children who are living in apartments. Also check in with any family members who are new homeowners, still getting to know their appliances. At Breakstone, White & Gluck, our lawyers specialize in personal injury, medical malpractice and product liability cases. Our lawyers are committed to fighting for justice for those who have been seriously injured or killed by the negligence and wrongdoing of others. If you have been injured, learn your rights. For a free consultation, contact our attorneys at 800-379-1244 or use our contact form.